It is common among us not knowing how to choose the right flatware set for home usage, but if you managed to choose the correct one, it may last for a lifetime or even to your next generation. Some of the things that you need to consider is whether it is made of stainless steel or silver plated, its patterns, its weight or whether you want to use it daily or only for special occasions. If you are a person who likes contemporary style, you will choose stainless steel flatware that comes with a matte finish, while people who like a classic or formal look will definitely look for a highly polished and ornate design flatware set. Firstly, you should determine the flatware’s composition, thickness, strength, style, balance, artisanship, and the attractiveness whether you are viewing it from the front or the backside. Imagine what you will be putting on these flatware, what you will be eating and etc. 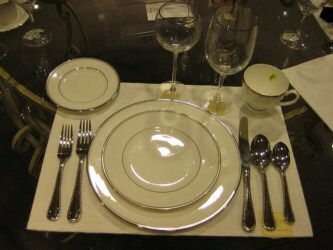 All of these points will help you to know the quality of the flatware and which one to choose. The next thing to take into consideration is whether to purchase a stainless steel or silver plated flatware. There is a lot of difference between both of the mentioned flatware, the stainless steel is a much superior flatware and besides that, it also comes with low maintenance, hygienic, durable, resists oxidation at high temperatures, rust free, resistant to stains or damage from fruit acids. Though silver plated is hard, it is less flexible than stainless steel and it is difficult to decorate it with stamped or carved designs. The weight of your flatware set also plays an important role in choosing the right flatware because a heavier flatware set provides you with a better balance, strength, and durability. It is common to have a perfect match and pattern of your existing chinaware with the flatware set that you are going to purchase. Though it shows only the personal choice relating to your style, it definitely provides a formal feeling whenever the flatware set and your chinaware are being displayed at your dinner table for special occasions. Speaking of chinaware, these dinner plates and more are considered to be the most expensive and classy of all the flatware set. The reason might be as its origin dates a long time back. More or less like a million of years ago.